During October 2010, a trial excavation was conducted at Er-Reina (Permit No. A-6027; map ref. 229681–727/736553–600), prior to construction of a private residence. The excavation, undertaken on behalf of the Israel Antiquities Authority and underwritten by Faraj Za‘rura, was directed by G.B. 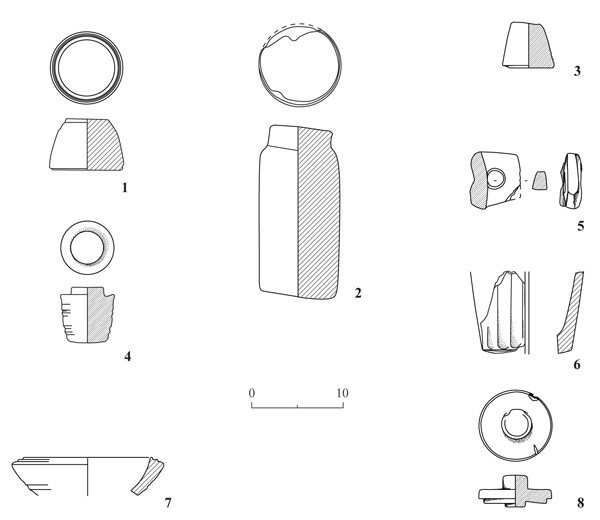 Jaffe, with the assistance of Y. Ya‘aqobi (administration), R. Mishayev and M. Kahan (surveying and drafting), M. Hartal (guidance), D. Amit (stone objects) and H. Tahan-Rosen (drawing of ceramic and stone finds). One excavation square was opened and two strata (1, 2) with architectural remains were exposed (Fig. 1). Pottery and stone objects dating to the Roman period were discovered in Stratum 2. The recycling of stone cores and their adaptation for use as loom weights was discerned for the first time in this excavation. Probe trenches, which had previously been dug in the square, were not excavated at this time. 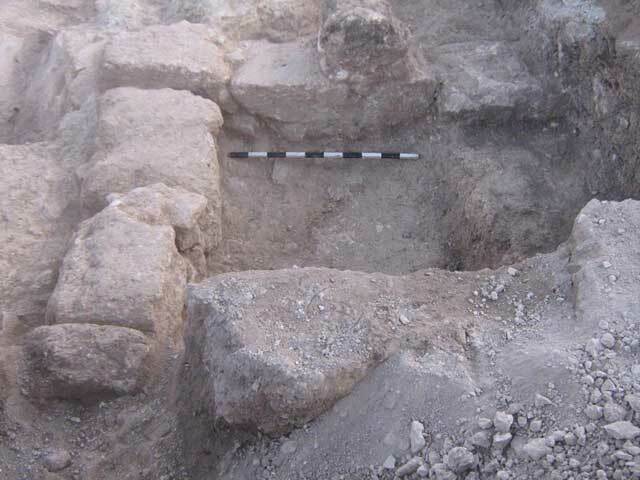 Remains of a wall, eroded pottery from the Persian, Hellenistic and Roman periods and eroded stone vessel cores were discovered in an excavation, conducted in 2010 south of the current excavation area (HA-ESI 124). A workshop where stone vessels were produced and stones vessel cores and production debris were found was exposed in an excavation, conducted in 2001 in a cave at the foot of Har Yona, between Mash-had and ‘Ain Mahel, 2–3 km east of the site (Permit No. A-3557). 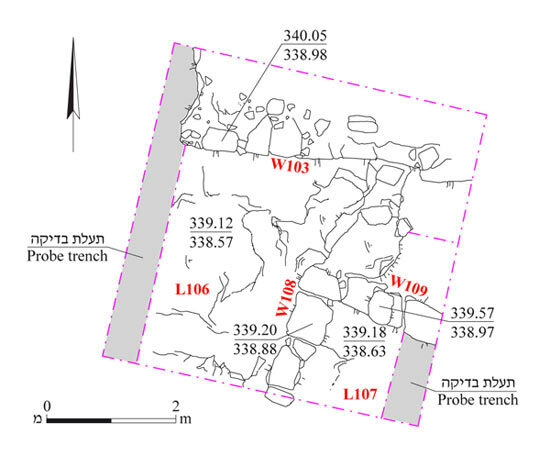 Remains of a stone vessel industry in the northeastern part of Er-Reina were documented in the survey of the Map of Har Tavor (Map of Har Tavor , Site 18). Stratum 1. The top of a wall (W103; Figs. 2, 3) was exposed while preparing the area with the aid of a backhoe. The wall, preserved two courses high, was built of large coarsely dressed limestone blocks set adjacent to the southern side of a hewn bedrock step. 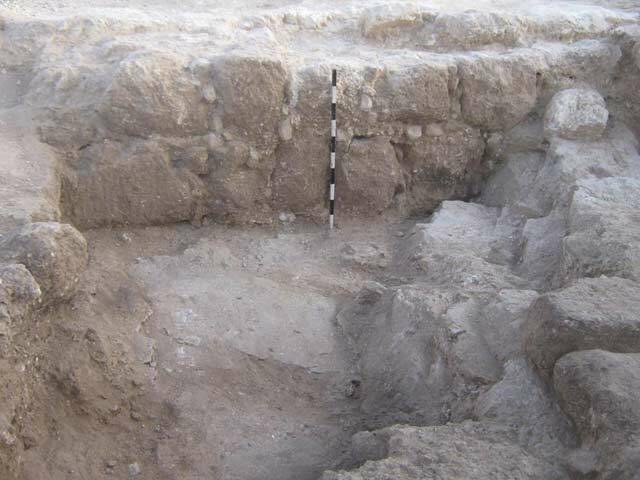 A layer of alluvium (L106; thickness c. 0.85 m), which contained mixed ceramic finds dating from the Roman to the Early Islamic periods, was exposed south of W103. Stratum 2. The tops of two walls (W108, W109) that form a corner (Fig. 4) were exposed at the bottom of the alluvium layer (L106). The two walls, preserved a single course high, were built of large dressed limestone blocks, set on the bedrock and similar to W103. From the top of the walls down, fragments of pottery vessels dating from the end of the Early Roman until the middle of the Middle Roman periods were discovered, including a bowl (Fig. 5:1), cooking pots (Fig. 5:2–4) and jars (Fig. 5:5–7). 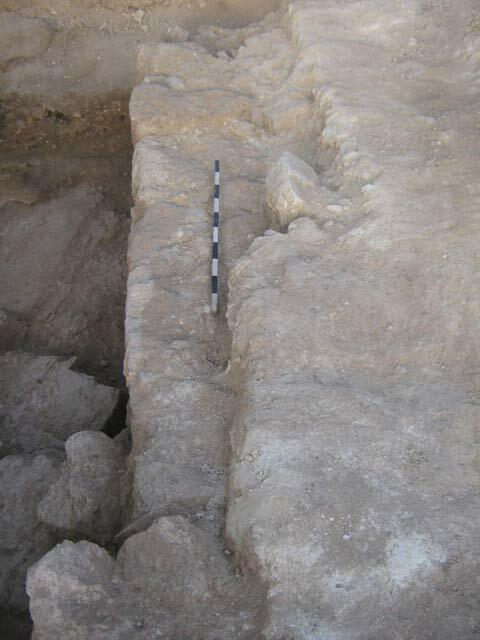 A large quantity of stone objects was discovered in this stratum in the southern part of the square, west of and inside the corner formed by Walls 108 and 109. Stone Objects. About thirty chalk objects, common to the Jews in the Second Temple period, were discovered in the excavation (D. Amit. 2009. Production of Stone Vessels in Jerusalem and the Galilee: Typological, Chronological and Technological Aspects. Michmanim 22:49–66 [Hebrew]). Most of the objects are core debris that was put to secondary use as stoppers (Fig. 6:1–4) and loom weights. A few of the objects are common vessels, including a broken handle of a measuring cup (Fig. 6:5), a side of a measuring cup (Fig. 6:6), a bowl fragment (Fig. 6:7) and a whole lid of a stone bowl (Fig. 6:8). 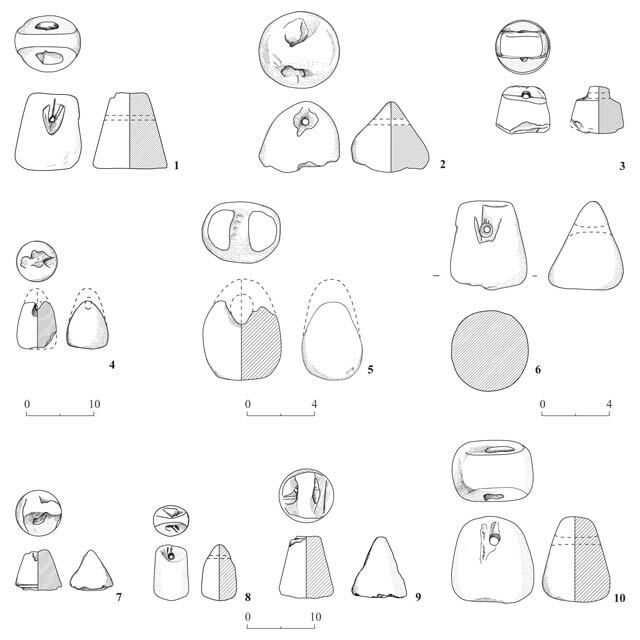 Evidence regarding the presence of a stone-vessel industry had previously been discovered at Er-Reina and its environs. A stone-vessel workshop was revealed in a cave exposed nearby. Several concentrations of various size cores, which were removed as waste from stone vessels when manufactured on a lathe, were discovered in the vicinity; the location of their production was not discovered. A similar phenomenon of debris concentrations of stone vessels whose place of production was not identified is known around Jerusalem. In some instances the production location is presumably situated nearby, possibly inside a cave whose opening has been blocked. In some cases, the cores might have been brought from their production location, where they were discarded as waste, to another site for recycling. Evidence of recycling stone-vessel cores has been discovered so far in both Jerusalem and the Galilee; they were usually adapted for use as stoppers (the Sages named these magofot) for ceramic jars and jugs. The stone core is shaped like a truncated cone and is therefore suitable for use as a stopper, which has a similar shape; furthermore, it usually does not require any treatment or modification whatsoever to the shape of the core. Evidence of a more sophisticated recycling of core waste for use as weights in a manner that required modifying the core was discovered for the first time in this excavation. About ten cores of various sizes, which were converted for use as weights, probably loom ones, were discovered (Fig. 7:1–10). The loom weights that are commonly found in excavations are clay weights occurring in various sizes and shapes, which characterize different periods. Most likely, the conical-truncated shape of the core led the weavers to consider this readily available waste in their immediate surrounding, as a suitable substitute for the conventional clay weights. To adapt the cores for use as loom weights, a horizontal perforation was drilled in their narrow ends, which was meant for tying the weight to the loom. Two methods of drilling the hole in the end of the core are apparent in the ten weights. A simple method whereby a perforation is merely drilled, without further cutting (Fig. 7:1, 2, 4–7, 9, 10), and an elaborate method in which vertical cuts were made in the rounded end of the core so that a narrow trapezoidal end was created with a ‘shoulder’ on either side, and the hole was drilled into this end (Fig. 7:3, 8). Based on the numerous loom weights discovered in Stratum 2, one can assume that a domestic workshop for weaving textile operated in the building whose remains were discovered in the stratum. These weights, which were derived from the waste of stone cores, are the first of their kind to be discovered in Israel, and they supplement our knowledge about the stone-vessel industry in the Jewish communities in the Galilee during the Roman period. 2. The top of Wall 103, looking west. 3. Wall 103, looking north. 4. The corner formed by Walls 108 and 109, looking north. 5. Pottery from Stratum 2.